Breast MRI is a noninvasive painless exam which uses a magnetic field, and radio frequency waves to produce high resolution and accurate 3D images of the breasts. Breast MRI may identify abnormalities not apparent on conventional imaging (mammogram and ultrasound). 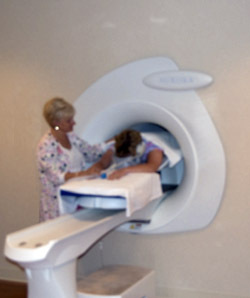 This modality is used in many settings, including screening of high risk women, evaluation of tumors prior to surgery, assessing implants and as a problem solver in certain cases.In conjunction with ProMedica, TRA offers the first and only dedicated breast MRI system in Ohio and Michigan, produced by Aurora Advanced Breast Imaging. The Aurora Breast MRI is the only fully integrated MRI system designed specifically for breast imaging and conveniently resides at the BCC.